At Budget Blinds of Huntington & Port Jefferson, we're your local neighborhood experts that truly understand your needs. We're in your neighborhood, we know the local Huntington & Port Jefferson weather and community, and we’re backed by the #1 provider of blinds, shades, and drapes in North America. Over 25 years of customer satisfaction gives you peace of mind that only comes with choosing the proven leader. We bring the showroom to you in Huntington & Port Jefferson. We expertly measure your space, install beautiful window treatments, and back it up with the best warranty in the business so you can sit back and relax in the beautiful, Huntington & Port Jefferson weather and sunshine. We serve to give you the best in window treatments, so you can rest easy knowing your space will be beautified and optimized with window treatments that fit your individual needs. If you’ve been thinking about transforming your home’s interior into something truly special, Budget Blinds of Huntington & Port Jefferson is here to help. 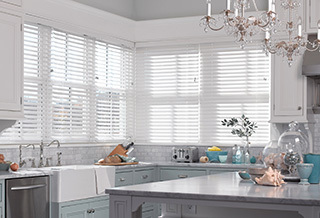 Our expert design team, paired with an array of stunning blinds, shades, shutters, drapery, and more creates the ideal home interior that complements any room, or an entire home. From the latest styles and innovative fabrics, to a host of on-trend colors, we’ll show you how fun and affordable it can be to upgrade your décor with the power of the #1 provider of custom window coverings in North America. Our consultative process is designed around caring about you and your home. We make the entire experience easy and convenient as we bring the showroom to you with our FREE in-home design consultation. From those unique shaped windows to energy efficient treatments, and more, Budget Blinds does it all for you, with style and service for any budget! We're local and here to stay to ensure you have peace of mind. "I was very impressed by the professionalism and expertise of Budget Blinds of The Hamptons, Huntington, and Port Jefferson. Sal obviously measured very accurately and David did a great job with the installation. My 8 windows look great and I feel your price was fair compared to other vendors. Thanks for a job well done." Despite being a very hard to please person, I can safely say that our experience with Budget Blinds of the Hamptons actually exceeded my expectations. Keith and Anita were very patient, professional and understood what my wife and I wanted. We spoke to several companies in searching for someone to help us with window treatments for our newly constructed home. In comparison to the others, it was clear to us that Keith and Anita genuinely cared about our needs and happiness. They provided great advice and recommended solutions that we ourselves would have never imagined. They answered all of our questions and spent much time to ensure that everything was perfect. The installation could not have gone any smoother. The installers (Dave, Dave and Ian) were courteous, professional and didn’t miss any detail. In the end, I am thankful that we were fortunate enough to have Budget Blinds of the Hamptons help us with our new home. From start to finish Keith and Anita were the consummate professionals. They made the process extremely easy. We had a large complex project in our West hampton Beach offices. They laid out options, made recommendations, had a quote and timeline ready for me within a day. They actually beat the timeline by more than a week, and installed a product that looks great, is easy to use, and was less than 1/2 the price of competitive quotes!!! Would use them again in a heartbeat!! Maura M.